Hello All! Welcome to the first dev diary of 2019. Today we wanted to make another dive into game mechanics. And since many people asked about naval rules, this is what we are going to cover in today’s issue. Of course, the main focus of Panzer Corps series is ground warfare. Compared to that, ships can be considered less important. At the same time, scenarios involving ships and naval landings provide a different set of challenges and for this reason feel unique and memorable. In Panzer Corps 2 we wanted to try and make the ships even more interesting to play with, both in single player and multiplayer environment. In scenarios focused on naval warfare, ships can be purchased, upgraded and repaired in ports and can capture neutral and enemy ports. So, it is possible to have up to 8 fleets struggling for control of a map, much like it works for ground units. We keep the basic “rock – paper – scissors” approach from Panzer Corps for capital ships, destroyers and submarines, but add a number of new rules on top. All ships are single entities, and their strength number indicates hit points. Reduced hit points do not automatically reduce the ship’s firepower. Larger ships, like battleships and heavy cruisers, have more hit points to reflect their higher survivability. All damage done to ships falls in two categories: “kills” and “wounds”. “Wounds” can be repaired in open sea, while “kills” can only be repaired in ports. One “wound” per turn is healed automatically. Unspent move and attack actions are used to heal additional “wounds”. When attacking enemy ships, both distance to the target and relative orientation of the attacker and the defender affects the accuracy of the shot. Smaller ships are also harder to hit from long distance. To better represent cooperation between ships, we introduce several new support fire rules. - Destroyers provide support fire against enemy submarines. - Ships with AA ability provide support fire against enemy bombers. - Capital ships provide support fire to smaller ships and naval transports against enemy capital ships. - Ships provide support fire to adjacent ground units against enemy ground units. This means that ships become very important in their role to support naval landings, especially destroyers because larger ships cannot enter shallow water. Submarines can switch between submerged and surfaced states. Surfaced submarines have better movement speed, spotting and firing accuracy, but can be spotted and attacked like any other ship. Only surfaced submarines can enter shallow sea hexes. Submerged submarines are much more difficult to spot: they can only be spotted only by destroyers, and only if they moved on their turn. Submerged subs also ignore ZOC of enemy ships. Carriers serve as mobile airfields. Air units attack from carriers and automatically return at the beginning of their turn. Each carrier has a certain aircraft capacity (up to 7), and aircraft types which it can carry are configured for each carrier type separately. - Damaged turret – reduced naval/ground attack strength. - Damaged AA turret – reduced air attack. As was explained in previous dev diaries, embark only requires unspent attack action, which allows to embark a whole army in a single port in a single turn. Same is true for disembark: it only requires unspent attack action, which means that naval transport can move and disembark on the same turn. This makes naval landings much more flexible. Additionally, infantry units have a special ability to attack directly from landing craft. This, combined with damage and suppression from other ships, allows pushing enemy units back from the shore. Please allow two questions/ideas, have you thought of naval mines and (German) s-boots https://en.wikipedia.org/wiki/E-boat with recon move as in McGuba’s Battlefield Europe? Regarding automatically returning planes, I had read this in previous dev diaries already, what if the map is bigger and you want to transfer planes from one area to another or you want to fly a long-distance attack (which might require more than one turn, possible given the range of some planes): could you then switch off the auto-return-function to airfields and carriers? One question: in the image, I'm seeing what looks like P38's and P40's. Neither of those were capable on landing on an aircraft carrier. Are you going to apply those rules - those that dictate that land based planes can not be serviced by aircraft carriers and must return to land based air fields for repair/resupply? Excellent news! I guess the sizes of the ships still need a bit of tweaking as destroyers' sprites are almost the same size as those of carriers or other capital ships? Last edited by calmhatchery on Wed Jan 23, 2019 9:40 am, edited 1 time in total. A wonderful set of changes. How does the capital ship supporting fire work? Ideally all capital ships in range of the attacker should attack it, not just those adjacent to the target. Which orientations are considered most favorable? I presume you mean the defender should be pointed straight at the attacker (so that the effect of range errors is minimized) and the attacker should be perpendicular (so it can fire all guns). Now do torpedo attacks (bombers, subs, destroyers) cause the target to change orientation? They should since torpedoes must be dodged. Also if we're taking radar into account and capital ships now have vision greater than 1, can we also account for the lack of rotating radar on German ships? I.e. it should be able to see further ahead of it than to the sides and rear. Also damaged radar should reduce attack, since WW2 capital ships did use radar for range finding. Watch your language. These aren't sprites, they are 3D models based on the Unreal tournament engine. If there's one thing Slitherine has been so, so clear about it's that this game is 3D and uses Unreal technology. But yes, a bit more size accentuation would help. Yeah, radar would be a cool thing… but then please note that Allied radar capabilities were more advanced than Axis capabilities, so this might lead to different vision ranges etc. I can't wait! 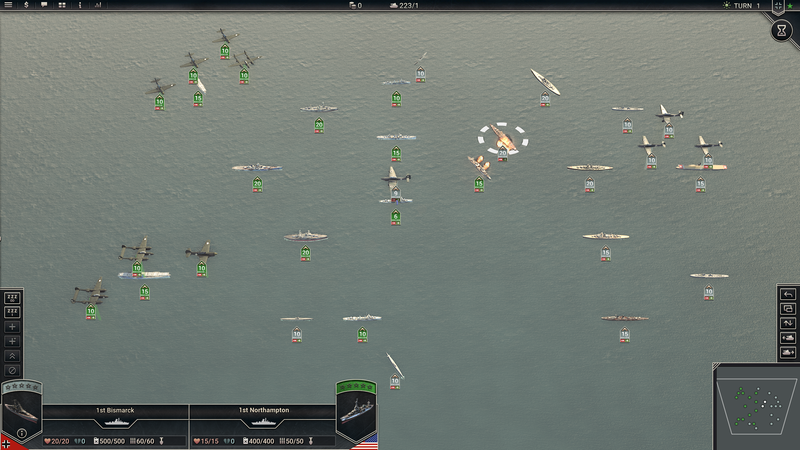 I love naval combat in strategy game. I'm very happy with support fire from disembarking ground units. I also like the idea tp have ships sharing their AA fire -- it works wonder in Order of Battle. Visually I hope ship will be a bit bigger -- planes look really big in comparison, and ships look tiny. This good. This gonna be epic. In scenarios focused on naval warfare, ships can be purchased, upgraded and repaired in ports and can capture neutral and enemy ports. One other thing- why are you guys obsessed with turning the hexes off? I get that it makes screenshots "pretty" but if you're taking to an audience that already plays the game why not screenshot it the way it will actually be playable? I would wonder how such special damage is displayed in the UI. Seems like it will quickly be problematic in many ways. Not showing a special damage icon displayed alongside the unit will lead to a lot of confusion when things magically aren't working. But a ship taking a pounding could potentially need multiple damage icons quickly creating a UI overload especially if multiple multi-damaged ships are near each other. Perhaps special damage should be binary. If you have some kind of special damage, regardless of what it is, one icon always shows. To get further information though, such as exactly what is damaged or if multiple things are damaged, you'll need to open some kind of expanded unit information panel. Bonus points for creativity and immersive-ness if the graphic that signifies 'special damage' is a black column of smoke rising from the ship instead of a UI object like a Red/flashing X. Last edited by Kerensky on Thu Jan 24, 2019 8:53 am, edited 2 times in total. Not a major thing, but I would like to see submarines get a special damage type too. Unable to submerge. If I remember my history right, this was a big thing with anti-submarine warfare. Damaged subs that couldn't submerge were sitting ducks. When we going to this i want to see : Smoke (Cruiser and DD will smoke area and reduce or drop to zero chance to be attacked from Planes), Hydroacoustic search, Surveilance Radar, Catapult Fighter (spot and reduced dmg from Airplanes), Torpedos, Depth charge etc... Aircraft Carrier (CV)... all ships with historical name... Graf Spee, Tirpitz, Hood, Duke York, Oktyaberskaya Revolutsya (like in Leningrad 41)... Remeber that Japs and US ships was strong but Germans was small pocket BB... and Soviet forces on see was no threat... and where is my Yamato??? And i expect DD will be perfect against BB but against CA will be less effective.... BB will be perfect against CA (or CL) but vs. DD will be blind and useless... CA (CL) will be perfect against DD but vs. BB will be less effective... CV can do lot of dmg to BB, DD but against CA (with strong AA) will be useless... US ships have better AA guns than Japs... Japs have stronger BB than US... Japs have worst radar... US have better Submarines... CV will be at balance... Germans and Soviet have zero CV, poor qualit of BB, decent CA, lot of DD, Germans have best uboots (submarines)... Pls take this on mind. Dont make equal ships to all nations. Will you consider historical placement of ships (like HMS Ark Royal in Atlantic/Med.Sea area) or done by player? I welcome additional rules to enhance naval warfare, but I fear that the developers may be taking it too far at the expense of simplicity and fun. I have played Order of Battle and got frustrated and annoyed by all the overly picky rules regarding naval units. (Same is true with some regarding ground warfare in that game.) I was hoping that PC2 would not make that mistake and go that far - but it appears from your post that it has. It adds too much tactical aspects to what's a strategic game. Thus all of these rules like warship orientation take the whole affair too far in my opinion, and if Order of Battle taught me anything, it's comes at the expense of fun by making it too complicated. It isn't essential to the overall primary focus of the game like entrenchment level/rules, for example. Kerensky has written in several posts on this forum warning of this danger in discussions that have come up regarding a wide variety of suggestions. I have grown to appreciate his judgement concerning where to draw the line between what would make a good addition/change to the game and what goes too far and would likely become cumbersome and problematic. I will keep an open mind and still of course give the game a try, but I must say some of these navel rule changes have dampened my excitement for the game. Hopefully I am proved wrong, or through play testing tweaks are make to ensure that my fears prove unfounded. I actually prefer OoB over Panzer Corps 1 for exactly this reason : Naval Battles are actually interesting and unique (while ground battle - while different - have the same level of fun), so to each his own . I would not call either game strategic though. They are tactical or operational at best. I hear you and I agree with you regarding Kerensky being a pretty level-headed guy. What you have to consider though is that some more complexity to naval fighting is necessary in order to be able to provide fun naval scenarios (i.e. the Pacific theater). While there are some isolated fun naval battles in PzC, such as the last two missions of Sealion, they just don't have the depth to make a whole campaign.